How Do Distracted Drivers Physically Respond? Study volunteers were monitored via standoff and wearable sensors. Graphic courtesy of the University of Houston. Texting while driving is much riskier than driving while emotionally upset or daydreaming, according to a new study from the University of Houston and the Texas A&M Transportation Institute. Researchers also found that all forms of distraction produce certain physical reactions in drivers — such as perspiration or accelerated heart rate — and cataloging these responses can help devise better strategies for making driving safer. The study’s researchers produced extensive data examining how drivers react to different types of distractions and published the findings in Scientific Data. Researchers conducted the study with 68 volunteers using a driving simulator. The volunteers had a valid driver’s license and normal or corrected-to-normal vision. They drove the same segment of highway four times in the high-fidelity driving simulator with no distraction and with cognitive, emotional and physical distraction. They were monitored using standoff and wearable sensors that recorded perspiration, heart rate, breathing rate, gaze and facial expressions to capture the drivers state as they were overloaded by multitasking. Tracking by thermal and visual cameras was also conducted. The simulator's computer recorded driving performance variables, including speed, acceleration, braking force, steering angle and lane position, according to a University of Houston press release about the project. The study split driver distractions into three categories, including sensorimotor, such as texting; cognitive, such as absorbing thoughts; and emotional distractions. Researchers discovered that texting led to far more dangerous driving, while a sixth sense appeared to protect those drivers suffering emotional distress or absent-mindedness. Texting interfered with that sixth sense, and drivers drifted out of their traffic lanes. 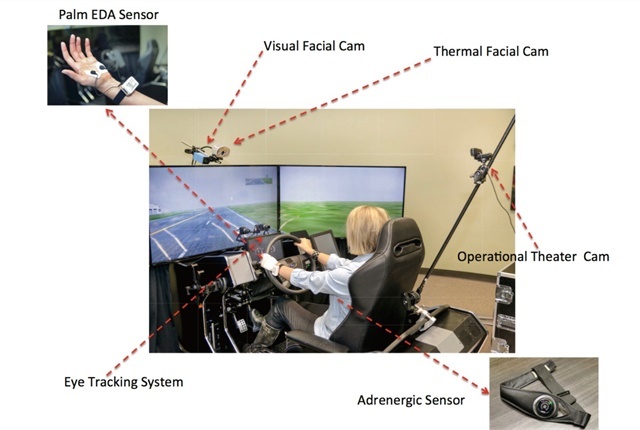 Further investigation revealed that "eye tracking and breathing rate proved useful metrics for measuring the impact of texting while driving," said Ioannis Pavlidis, a professor and director of the computational physiology lab at the University of Houston. "But that wasn't helpful in cases of emotional or cognitive distractions." Nonetheless, researchers discovered that heart rate signals, which were captured using wearable sensors, and perspiration near the nose, which was detected using miniature thermal imagers, could track all forms of distraction, Pavlidis noted. Such research can provide the groundwork for future safety systems, said Robert Wunderlich, the institute's director of the Center for Transportation Safety. Many drivers already wear smart watches and exercise trackers capable of measuring heart rate. The research paves the way for universal sensing of distraction. The potential market for distracted-driving intervention is enormous. According to the National Highway Traffic Safety Administration, 3,477 people were killed and 391,000 were injured in motor vehicle crashes involving distracted drivers in 2015.